Ellie Goulding failed to flash a smile as she arrived at LAX on Thursday. The “Love Me Like You Do” singer, who’s reportedly taking some time out from her relationship with Dougie Poynter because of their busy schedules, is currently in the city to promote her third studio album, “Delirium“, and perform at KIIS FM’s Jingle Ball. Despite looking kind of gloomy, the 28-year-old singer was still able to show off her styling prowess as she sashayed through the terminal in a pair of fitted black pants, a low-cut black tee, and a brown suede jacket with fringe detail. She accessorized with a long silver necklace and a couple of earrings and kept her eyes hidden behind a pair of black sunnies. Her minimal makeup and no-fuss side-parted hair were the finishing touches to her casual-chic airport look. Ellie chose a very comfy pair of sneakers by Saint Laurent for her feet. 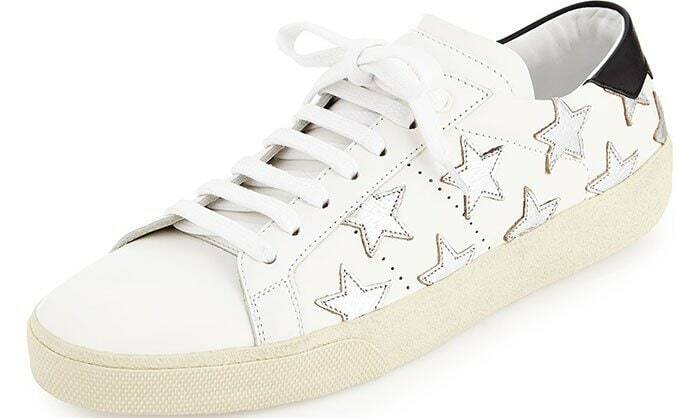 They are made of white leather and feature contrast star embroideries, metallic silver leather tabs at the back, lace-up fastenings, logo-detailed tongues, padded insoles, and rubber soles. 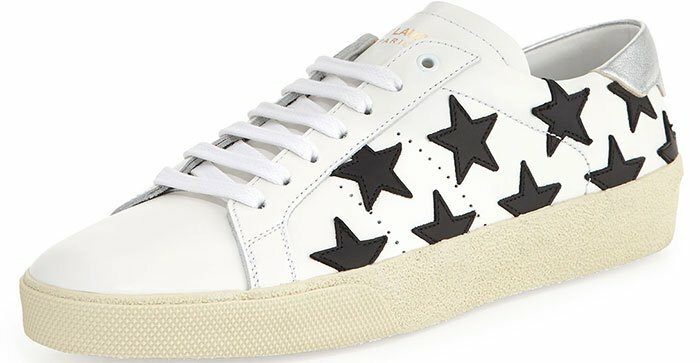 These sneakers can be purchased in different versions at Neiman Marcus, Farfetch, Luisaviaroma, and Saks.